to get more clients coming to you. and I'm giving it to you for free. This 34-page guide will show you how to get more clients coming to you. It's called the EYES and EARS Method, and I'm giving it to you for free. 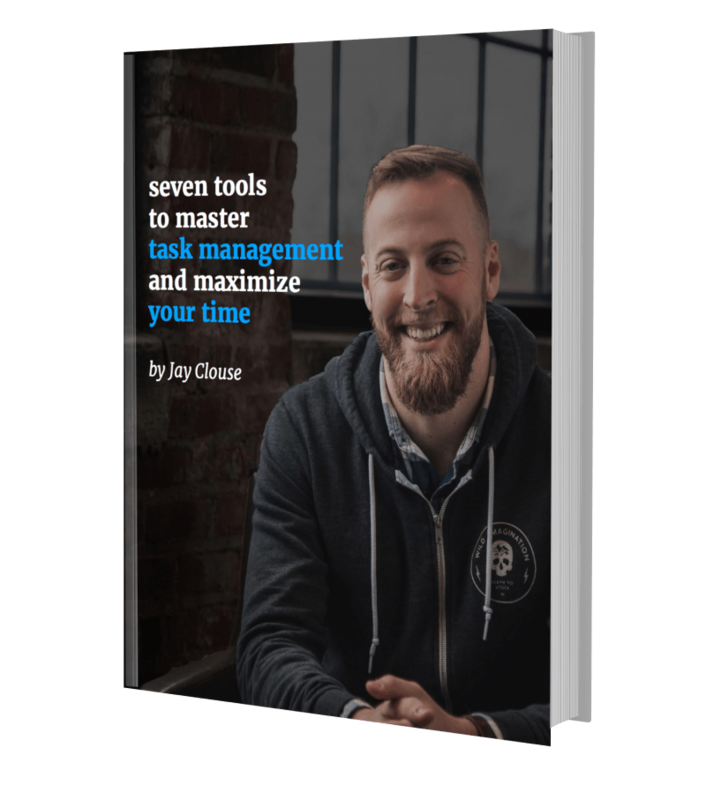 PS: AWeber called it one of "12 Exceptional Newsletters"
Over 20 pages detailing the exact tools and methods I use to manage my own time. It also includes a 10-minute video tutorial showing how I utilize some of these tools. Created during my time as a product manager, these tools and methods have allowed me to get so much more out of every day. A common theme that comes up in conversations in the Unreal Collective community is the struggle with self deprecating thoughts and head trash. I think it’s a cultural thing — part of where our society is right now. When we see beautiful highight reels on social media showing all the COOL stuff other people are doing (you met who?? you were speaking where??) we question our own legitimacy. When I first started Unreal a couple of years ago and offered coaching services as an add-on, I had never offered formal consulting before. One of the first clients to sign up was someone who had a multi-million dollar exit just a few years earlier. This really threw me for a loop. What could he possibly learn from me? I started to really get into my own head before our first call. I had to hype myself up…I had to make him believe that he made a good choice! My coach would say that I was trying to “prove” that I belonged. Over time, I began to understand something that I now call “experience ladders.” Imagine a wall with a whole row of ladders lined up next to one another. Obviously, we all have our own particular set of skills. We have a perception of our own skill level, and of the skill level of those around us. Same goes for the people we work with! Think of each of those skills as a ladder. 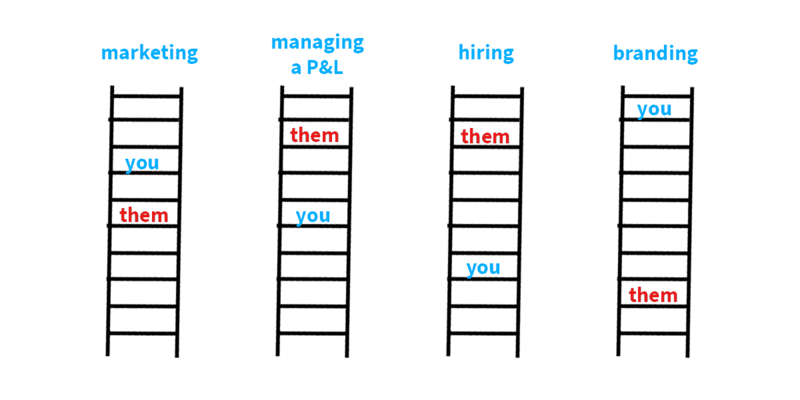 We ballpark our position on a ladder relative to others pretty much constantly, in all aspects of life. And when we think someone is higher on the ladder than us, we look up to them and try to learn from them. Here’s where things get sticky. Sometimes, when imposter syndrome rears its stupid little head, we consolidate the ladders into ONE ladder. We begin thinking of an absolute “skill score” and estimate others relative to ourselves. To be successful in working with and solving problems with others, you need to be confident and secure in your position on the ladder. And not just on the ladders that you are perched high on — but also those where you are behind your client. Understand that you aren’t being hired to help every aspect of someone’s life or business. They are hiring you for very specific ladders (skills) where you excel. Instead of posturing and “proving” that you can swing on every ladder, be secure in the fact that you have a ladder you were hired for. You don’t have to help on all of them. In fact, recognize the client for the ladders where they can help YOU. Focus on where you can help the most. Be confident and secure in those skills, and you’ll do better work (and enjoy it more too). are trying to sell the hard way. Most freelancers and creatives are trying to sell the hard way. Most of my conversations are related to sales and finding clients. It makes sense -- sales are at the heart of all businesses, and I’m constantly talking to business owners (even those with a side hustle). The internet and some breakout, outlier successes have had a profound impact on how so many of us think about sales. Having a website and passive income is the new American dream. We are beginning to expect that we should be able to sell online, with automation, at scale with very little personal contact. And if we aren’t doing that, if we don’t have clients walking through our doors from our website, social media, or advertising, we feel like we’ve lost the fight. But this isn’t Field of Dreams. If you build it, that doesn’t mean clients will come. Relationship selling is alive and well and truly at the heart of so many thriving businesses. Especially in the beginning. One-to-one relationships between yourself and another individual can still truly drive results in your business. Here’s the problem: we are impatient. By the time we start thinking about our sales strategy, we may be frantic or panicked about next month's rent. Unfortunately, that’s not how relationships work. Relationships are forged out of trust and the absence of personal agenda. If you begin a relationship for the purpose of making rent, it’s not going to be very strong. If you’re struggling to make sales now, the unfortunate truth is that the relationships that should be converting to sales for you right now should have begun months ago. You could have so many strong relationships that by sheer statistics alone, you would be welcoming new business. OK, Jay, but that doesn’t really help me in the pickle that I’m in right now. There are creative solutions for any problem. But while you explore those, it's time to work on a little ‘preventative medicine’ to ensure this situation doesn’t happen again. This 34-page guide will give you my best advice for getting more clients. It's called the EYES and EARS Method, and I'm sharing it with you for free.